Then-seminarians, from left, Don Kettle, Ragheed Ganni and James Mason visited at the Pontifical Irish College in Rome, circa 1999 or 2000. Father Mason keeps this photo and a holy card of Father Ganni in his breviary. Holy card of Father Ganni. Iconic imagery of the war in Iraq shows the U.S. Army pulling down the statue of Saddam Hussein in Baghdad’s Firdaus Square on April 9, 2003. While a sledgehammer-wielding man made little headway on the statue base, soldiers rolled up in a tank, wrapped a chain around the statue’s neck, covered the face with the U.S. flag and let ‘er rip. Hundreds of Iraqis cheered and celebrated their liberation from the brutal dictator. But not everyone was so moved. 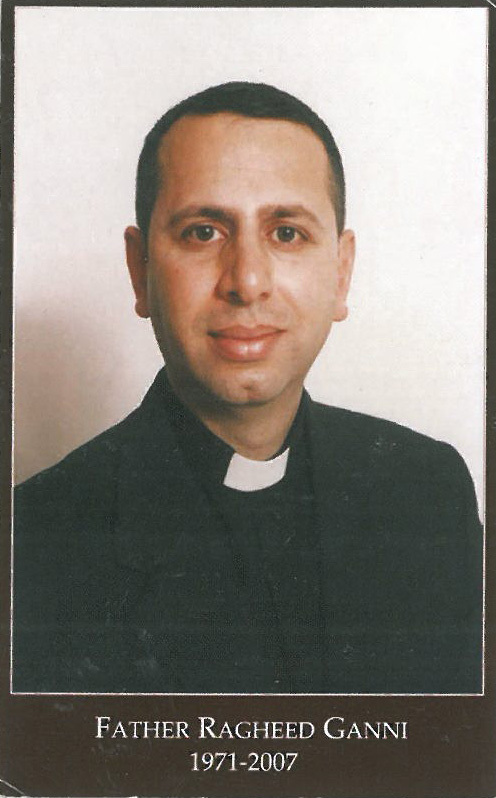 In fact, Father Ragheed Aziz Ganni predicted persecution for minority Christians and brethren Chaldean Catholics as a result. The Vatican’s Congregation for Saints’ Causes recently gave permission for the opening of the sainthood cause for Father Ganni and the deacons, recognizing Father Ganni’s decision to remain at the parish and celebrate the faith. Father Mason keeps a photo of himself, Father Ganni and mutual friend Father Don Kettle of Perth, Australia, in his breviary, along with a Father Ganni holy card. Father Mason received the holy card from a Chaldean Catholic seminarian from Detroit for whom he led a 30-day silent retreat. With the photo and holy card in Father Mason’s breviary, his buddy is never far from his thoughts. In fact, Father Mason isn’t shy about asking for Father Ganni’s intercession. St. John Paul II called the 20th century “the century of martyrs.” Many are killed in the Middle East, where Father Ganni told Father Mason that religion and politics are “complicated”. According to Father Ganni, as told to Father Mason, Hussein protected the Christian minority in building his coalition. Sadly, Father Ganni proved to be correct with that assessment, and paid with his life. This in no way justifies the evil acts of the Assad regime, but helps explain concerns among the Christian minority.